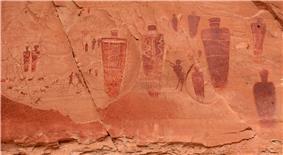 Holy Ghost panel in the Great Gallery, Horseshoe Canyon. Horseshoe Canyon, formerly known as Barrier Canyon, is in a remote area west of the Green River and north of the Canyonlands National Park Maze District in Utah, USA. It is known for its collection of Barrier Canyon Style (BCS) rock art, including both pictographs and petroglyphs, which was first recognized as a unique style here. 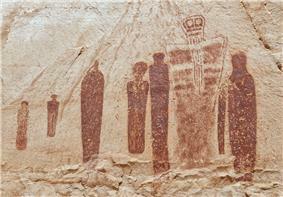 A portion of Horseshoe Canyon containing The Great Gallery is part of a detached unit of Canyonlands National Park. The Horseshoe Canyon Unit was added to the park in 1971 in an attempt to preserve and protect the rock art found along much of its length. The Great Gallery is one of the largest and best preserved collections of Barrier Canyon Style rock art in the United States. The gallery was a product of the Desert Archaic culture, a nomadic group of hunter-gatherers predating the Fremont and Ancestral Puebloans. The panel itself measures about 200 feet (61 m) long and 15 feet (4.6 m) high. The panel contains about 20 life-sized anthropomorphic images, the largest of which measures over 7 feet (2.1 m) tall. Reproductions of the paintings are in the Museum of Modern Art in New York and the Denver Natural History Museum. The Horseshoe Canyon trailhead is located on the west rim of the canyon. It can be accessed from State Route 24 via 30 miles (48 km) of graded dirt road, or from Green River via 47 miles (76 km) of dirt road. Both routes include segments of road that may become impassable when wet. Visitors may camp at the west rim trailhead, on public land managed by the Bureau of Land Management, or BLM. A vault toilet is provided but there is no water available. Overnight camping is not permitted in Horseshoe Canyon inside the Park boundaries. To see the rock art, visitors must descend 750 vertical feet to the canyon bottom and hike approximately 3 miles (4.8 km). The hike from the West Rim trailhead to the Great Gallery is roughly 6.5 miles (10.5 km) round trip, and requires 3 to 6 hours to complete. The trail is fairly well marked, but reaching the Great Gallery requires a certain amount of stamina and endurance, particularly in the heat. A gallon of water per person is recommended to prevent dehydration. Water sources are unreliable in the canyon. Three other significant panels of rock art are passed en route to the Great Gallery.